Enclosed in a 50mm and 45mm high-polish stainless steel case with rotating bezel topped in eye-popping anodized aluminum tints. Exhibition case back is an efficient Japanese SII NH38A automatic movement. 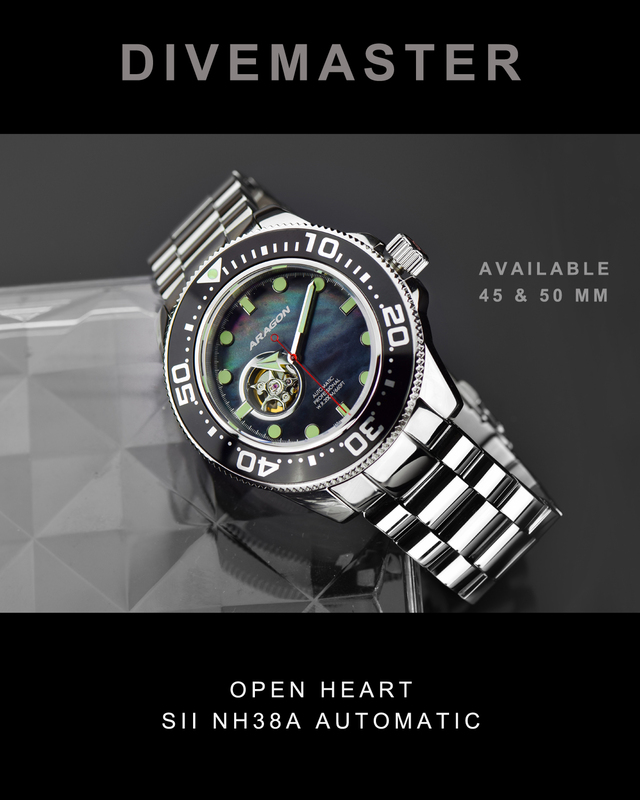 Exquisite MOP in dreamy black or platinum blue Mother-of-Pearl dial, and pierced to allow a view into the beating heart of the 24-jeweled movement. Silver-outlined luminous hands complete this modern dial. A ridged screw-down crown ensures water resistance to 20ATM/200m/660ft and the linked stainless steel bracelet in matching polished finish is secured with a fliplock safety push-button deployant clasp.